Mediapreneur and Expoze Nigeria's CEO Adetona Ademola, popularly known as Demola Expoze made it this year's Future Awards Africa nomination scheduled to hold on Saturday, December 9, 2017, at Federal Palace Hotel, Victoria Island Lagos. Announcement for the year's nominees was televised on Wednesday; November 22nd on Hip TV, Channels TV, Spice TV and OnTv; revealing a whopping 21 categories with five selected nominees in each. 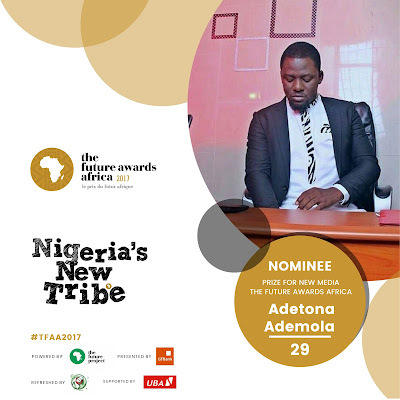 Ademola has been nominated for the 'Prize for New Media' category; vying against four other colleagues in the new Media space; namely Femi Bakare, Richard Akuson, Dolapo Adeleke and Delphine Okobah. Ademola prepared for his career with Expoze Magazine back in the University days fast forward to 2017 the company has not stopped delivering proffering strategic online presence to her clients and delivering award winning campaigns for multinational and international brands. The Future Awards Africa 2017 will mark the ceremony's 12th edition, since their emergence in 2006. The award has been described by Forbes as "Nigeria's most outstanding award for young Nigerians".